Your hair can be moisturized with product but still not have healthy hydration. Finding the right product to give your hair moisture is only half of the hydration battle. The goal to healthy hair is getting your hair to receive and hold moisture for long periods. How do I know if my hair is hydrated? Your hair stays soft, stretches without breaking. 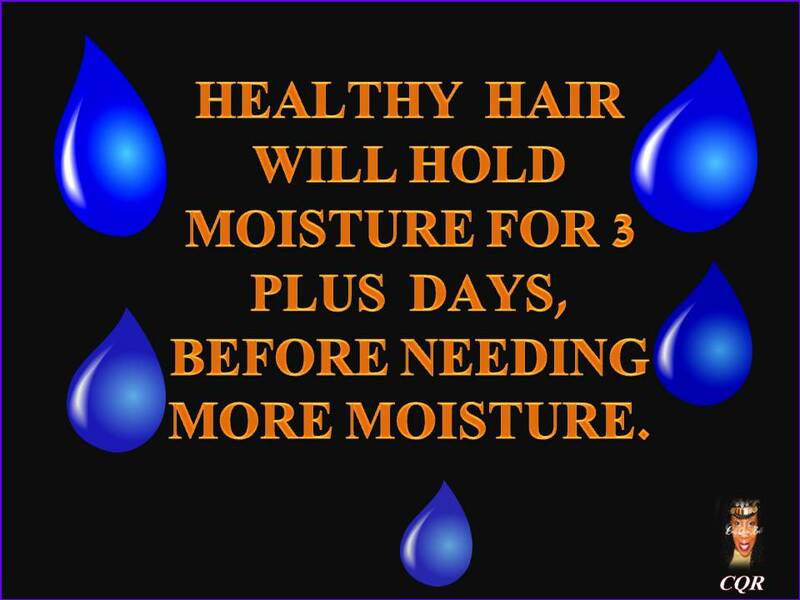 Hair holds moisture for 3 days. Absence of single strand knots. You can separate your hair with no webbing. You have better coil definition. You have lots of shrinkage. How to get hydrated hair? Eliminate all products with harsh ingredients. Replace them with products as close to natural as possible. Follow a good regimen, such as the CoilyQueens Regimen. A good regimen must include frequent cleansing and conditioning. Stay away from covering your hair in fake hair for at least 1 year after beginning a regimen. Be consistent, expect gradual improvements each week. Be patient it can take 6 months or more for healthy hydration. Make the above statements apply to your hair and regimen. Do not use products that contain these alcohols. HOW DO I BEGIN MY HYDRATION JOURNEY? Now you have an understanding of how hydrated hair performs. 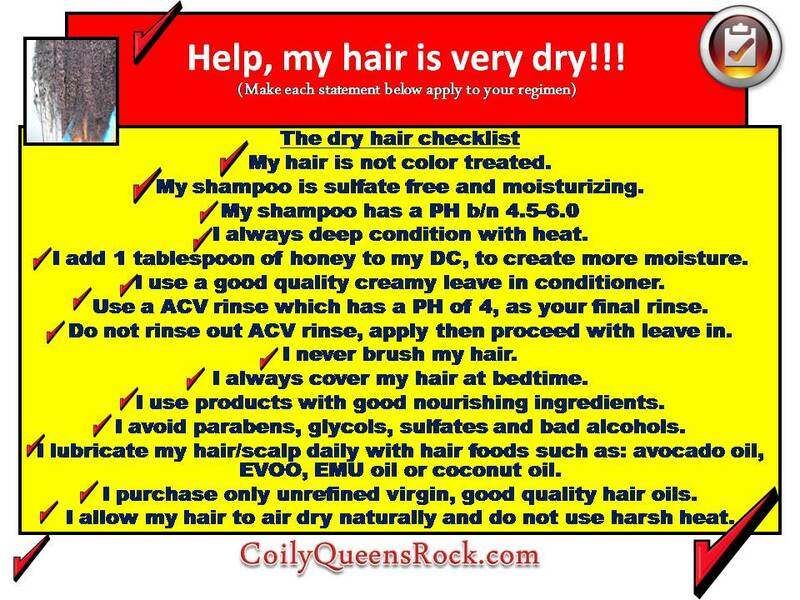 Start with the dry hair checklist. Make corrections according to the do's and don'ts listed. Eliminate all products with not so natural ingredients in them. Having a healthy head of hair can take 6 months to a year of being consistent. It all depends on the condition of your hair, when you begin. You will see the best results starting with natural hair at the TWA stage. Your hair is new and easier to hydrate. So when you are expecting results remember where you started. If you have damaged ends go ahead and cut them now. Do not waste anymore time holding onto those ugly ends just to maintain a certain length. You will be glad you did and it will grow back faster.